"There were several reasons why I selected Baylee for the position of marketing coordinator. During her co-op, she demonstrated great social skills with other members of our organization. Baylee’s maturity level is far beyond her age. She completed every project on time and was collaborative with the people on the project. Also, she was very eager to learn everything about our business and help in every way possible. Point Park University prepares students for the fundamental aspects of their career. The employees I have hired from Point Park have demonstrated great book-smart skills, but even better interpersonal and social skills. I believe Point Park’s commitment to having professors and instructors who have worked in the fields of study provide students with reasonable expectations and the knowledge they will need to advance in their careers." 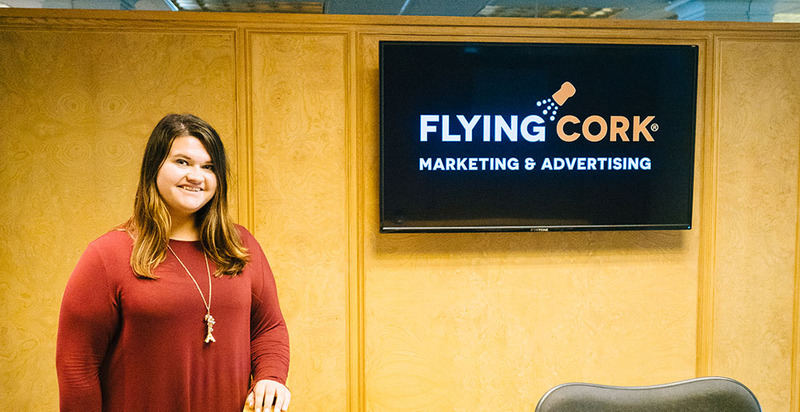 "About halfway through the completion of my co-op program, I was offered a full-time position with Flying Cork upon graduation. I’m currently doing an array of things in my position, from setting up and managing Amazon accounts for clients, to project management for a new client." Tell us about how you landed your marketing coordinator position before graduating. I reached out to Jessica Hobson, Point Park's cooperative education specialist in the Career Development Center, during the fall of my senior year about options in my field. She connected me with Flying Cork, where I was offered a co-op position for the spring of my senior year. About halfway through the completion of my co-op program, I was offered a full-time position with Flying Cork upon graduation. I’m currently doing an array of things in my position, from setting up and managing Amazon accounts for clients, to project management for a new client. As a native of Eastern PA, what factors made you choose Point Park in Pittsburgh? When I found the sports, arts and entertainment management major at Point Park University, I could not resist! Not only was this a program that wasn’t offered by any other university, but it was also located in the heart of Downtown Pittsburgh. As a Kutztown, Pennsylvania, native, it was a total change of pace for me, and the type of change I was looking for after graduating high school. After speaking with several professors about the program and attending some SAEM events for high school students, I was convinced that the program, school and city were the right choices for me! Some of my favorite Point Park memories include my internship with the Pittsburgh Steelers during my senior year, attending Pollstar Live! in LA during my junior year, going to The Waterfront every Friday night with my roommates, spending time at The Point, having concerts and sporting events within walking distance and exploring different areas all across the city! My career goals include learning as much as possible and to use my SAEM degree to the fullest! I love learning new things, so for the time being I’m taking in everything that I possibly can to ensure growth within my company. My SAEM degree will help me achieve this goal since my position has mainly been applying what I’ve learned in the classroom.